Peshan Goyee (Predictions) of Niamatullah Shah Wali authored by Nawabzada Niaz Dil Khan Advocate. 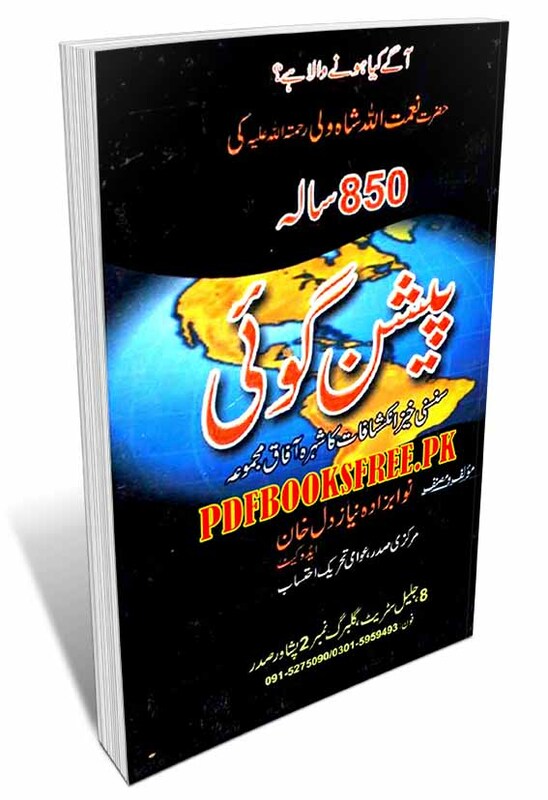 This book contains the most famous collection of sensational predictions of Niamatullah Shaha Wali about 850 years of future in Urdu language. 850 Sala Peshangoi book is now available on Pakistan virtual library in Pdf document for the study of our visitors. Check out the following links to read online or download the complete book in Pdf format and enjoy offline reading in your computer and smartphone. very good u are doing great work…. i am very greatful thanks to all of you. now i got my book that available only u have. Great job May Allah Bless you More for such a Good job. Thanks for the knowledge, May Allah give you reward Ameen. thank u sir/mam who ever u r… i was searching for Naimat Ullah shah’s actual words on internet for the future predictions… I was unable to find…. u made man… thanks alot… u dnt kw how much hapy i am now.